A prisoner is forced to go into one of three rooms, but he can choose which room. The first room is ablaze with fire. The second one is rigged with explosives that will go off as soon as he enters. The third contains a pair of lions who haven't eaten in years. Which room should he choose to survive? 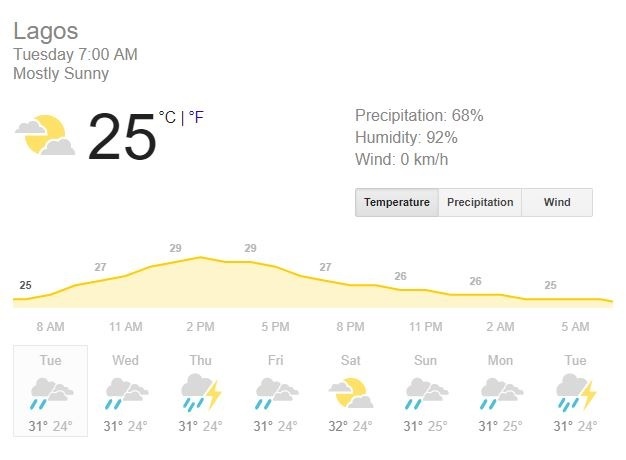 Lagos: Temperature, 24°C - 30°C. Mostly cloudy with 70% chance of rain. Abuja: Temperature, 19°C - 28°C. Mostly cloudy with 51% chance of rain. Port Harcourt: Temperature, 20°C - 25°C. Intermittent clouds with 65% chance of rain. Ibadan: Temperature, 22°C - 30°C. Intermittent clouds with 42% chance of rain. Kano: Temperature, 18°C - 37°C. Very sunny with 0% chance of rain. Riddle Me This - A prisoner is forced to go into one of three rooms, but he can choose which room. The first room is ablaze with fire. The second one is rigged with explosives that will go off as soon as he enters. The third contains a pair of lions who haven't eaten in years. Which room should he choose to survive? The third room—any lions who hadn't eaten in years would be dead!